A cask of Royal Lochnagar 30 Year Old gifted to Prince Charles has so far raised £225,400 for charity, ahead of the auction of bottle No.1 next week. 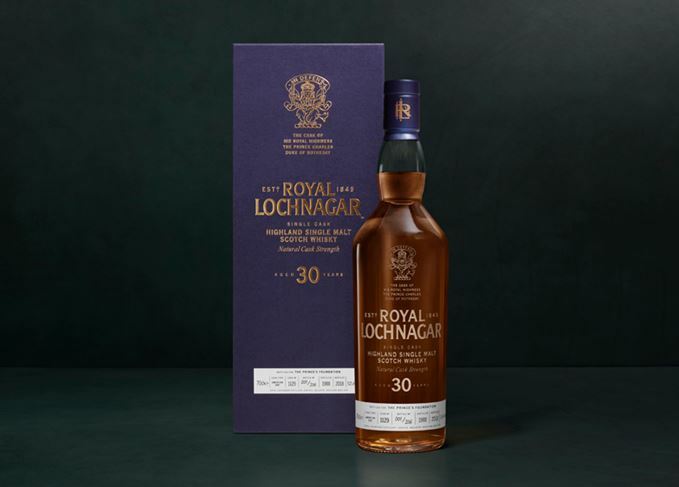 The first bottle of Royal Lochnagar 30 Year Old, one of the oldest official releases from the distillery, will be auctioned between 3-12 February at whisky and fine spirits specialist Whisky.Auction. Its auction follows the balloted sale of 184 individually-numbered bottles by spirits retailer The Whisky Exchange last month. As with the general release, proceeds from the auction will be donated to Prince Charles, the Duke of Rothesay’s charity The Prince’s Foundation, in particular for its work at The Carriage tearoom at Ballater Station on Royal Deeside. Matured in an American oak hogshead cask and bottled at a natural cask strength of 52.6% abv, the expression is described as having ‘pear and marzipan’ notes on the nose, with ‘walnut and coconut flavours’ on the palate. The Highland distillery originally gifted the cask to Prince Charles, the Duke of Rothesay, in 1988 to mark the 140th anniversary of the first royal visit to the distillery in 1848 by Queen Victoria and Prince Albert. It was bottled on 14 November 2018 to mark the Prince’s 70th birthday. Bottle No. 1 features etched, infilled gold lettering and is presented in a Royal Lochnagar blue presentation box with a handwritten label. A total 206 bottles have been produced, with 184 sold through a ballot with The Whisky Exchange, a further 20 donated to The Prince’s Foundation for future fundraising and one bottle retained at Diageo’s archive in Scotland.